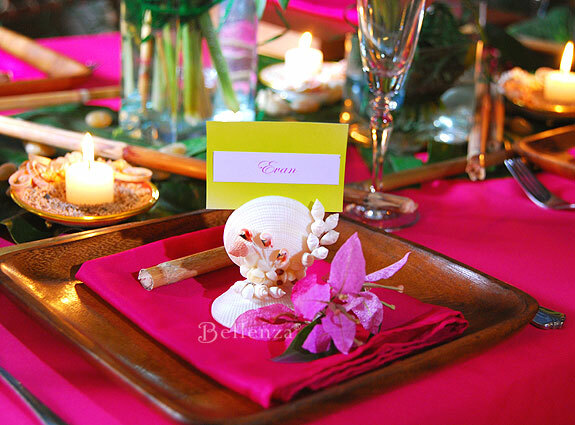 Home / Slideshow Gallery / Beach-inspired Tablescapes To Make Your Summer Wedding Sizzle! Beach-inspired Tablescapes To Make Your Summer Wedding Sizzle! Summer is knocking at the door! 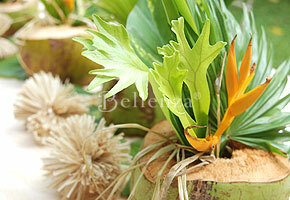 And the key to creating beautiful “in season” wedding tables is through tropical-inspired tablescapes. Even if an actual seaside venue isn’t possible, you can create that summer getaway look—whether it’s for an intimate engagement party at home or a lovely outdoor reception overlooking a lake or a casual rehearsal dinner. Using textural elements such as leaves, shells, and wood for your table settings allows you to achieve the look with surprising ease. Just see how we’ve put together tropical beach-inspired table settings ranging from those with a cool, muted color palette to dramatic ones set with lush foliage and vibrant colors. 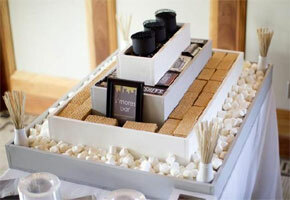 With these as inspiration points, assembling your own table settings couldn’t be more fun and exciting! 1. 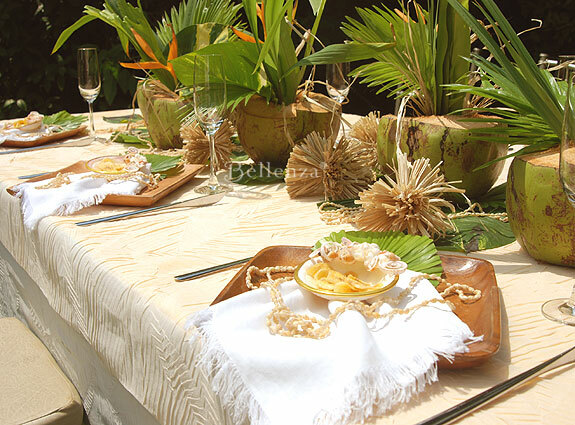 Go Chic with Nature – With a table inspired by beautiful Key West, set a canvas of ivory and green as nature is the focal point of the table décor with foliage, coconuts, and shells. 2. Use a Variety of Shells – Turn a table setting into one with an inviting and elegant look by incorporating shell accents in various shapes, sizes, and even colors. 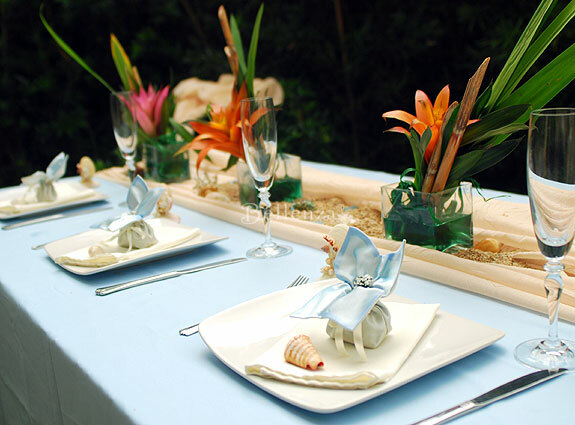 Consider shell trays that can be used to hold condiments at the table, seashell card holders bearing the table menu, or give guests a handmade shell frame tucked with a thoughtful note from the bride and groom. 3. Think of Summery Hues – For a summery color palette with an outdoor feel, consider relaxing blues and lilac to eco-friendly shades of green and ivory. 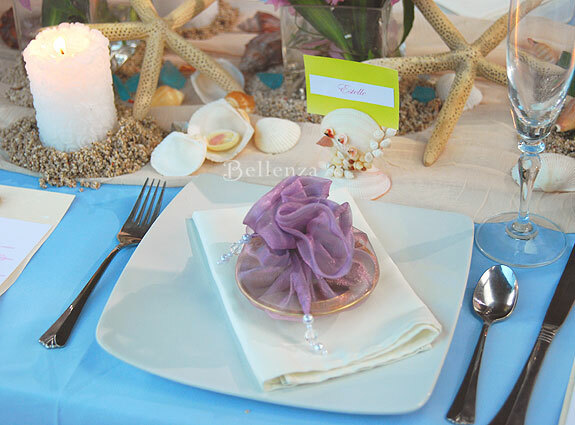 Or you can even have a sea-inspired palette of blue, green, and lilac hues. 4. Make it Romantic with Candlelight – Set pretty candles in white amidst sand and stone accents. 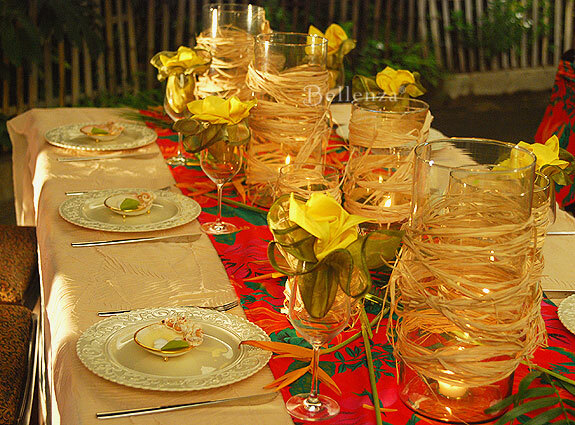 Then infuse additional lighting with little tealights cast in beautiful shell dishes. Alternatively, you can also have sphere-shaped glass bowls filled with real gold fish. 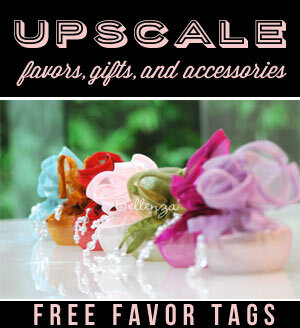 Read Unique and Easy Centerpieces You Can Do Yourself. 5. Location as Décor – By finding the right venue, you can actually save on table decorations by letting the surroundings provide the ambience for the party. 6. Fruits Become Handy for Centerpieces – Think of tropical fruits such as pineapples, bananas, and coconuts as elements with unique colors and textures, which you can use for arranging an attractive and easy table centerpiece. 7. Apply Organic Décor Accents – Consider accents such as shells, but also leaves, bamboo, raffia ribbons, sand and stones, including tableware made of wood. 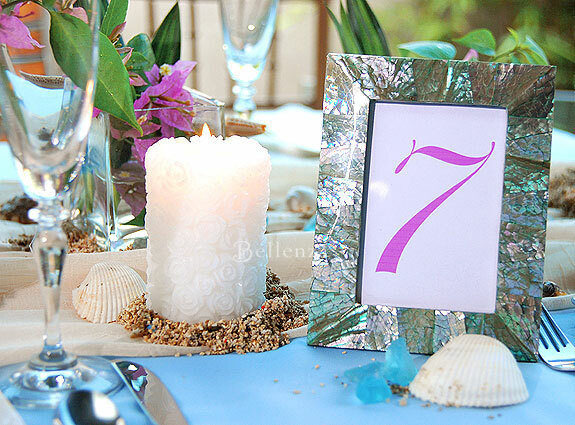 As an example, an abalone shell frame can be used to hold a table number. 8. Make Creative Table Napkins – Turn ordinary table napkins into artistic pieces of work. Fold them to resemble pineapples or make them mimic a pretty flower flowing out of a wine glass. For more ideas, see Become a Table Napkin Artist. 9. Pick an Inspiring Place – Even if you can’t head out to an exotic destination for a summer wedding, find inspiration for your décor such as a Caribbean-inspired table setting. 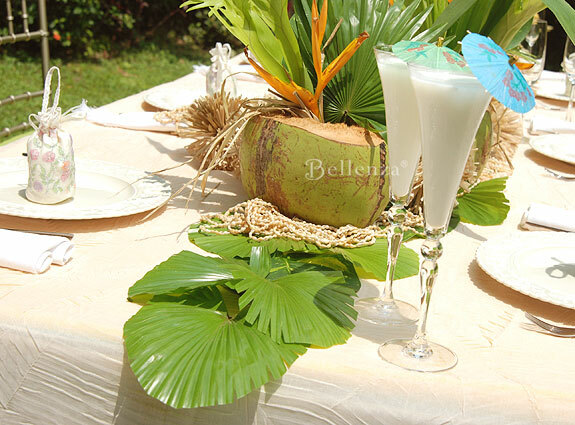 Read 3 Truly Tropical Table Ideas for a Caribbean-style Wedding Celebration or Bring the Caribbean Home for a Jamaican Inspired Engagement Party. 10. Find Alternatives to Flowers – Try tropical plants that have shapely leaves such as areca palm leaves, monstera deliciosa, or anthurium leaves. Who would’ve thought summer wedding tables could have such varied looks?! I especially love the cool, sky blue setting. Thanks for such great ideas. I’m from London and we have nothing like the beaches you see in the tropics. These tablescapes are so inspiring. Even if you can’t go to some exotic place. 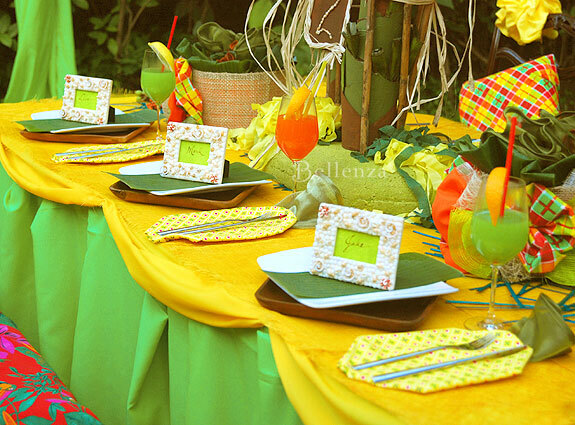 Having the right table decor can make you feel like you’re somewhere else! THanks. Kirei ne. I love this concept! I love these! Got any ideas for a poolside wedding? 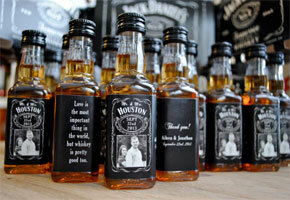 I’m afraid of having a tacky reception.